A classic meal featuring the best of both worlds. This meal includes a 2 lb. Roasted Turkey Breast that's plump, juicy and fully cooked. 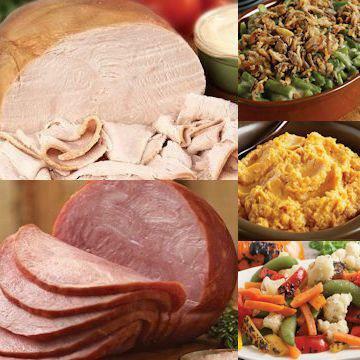 We will also grace your holiday table with a traditional smoked boneless ham. We cure the ham, then hardwood smoke it to lock in the sweet, juicy flavor. Add a delicious array of trimmings including Green Bean Casserole, Roasted Vegetables in garlic oil and Whipped Sweet Potatoes and you've got a meal that is sure to impress! Meal serves 4 to 6. Don't forget to checkout our appetizer and desserts too. Thaw in refrigerator. �Cold Entrees: Slice roasted turkey breast and serve. Oven: Preheat oven to 350�F. Remove roasted turkey breast from packaging and place in baking dish. Cover with foil. Bake 40-50 minutes. Do Not Thaw! Microwave: Cut slit in center of film. Place tray in microwave; cook on high for 4 minutes. Carefully remove film, stir and cook on high for 3 minutes or until internal temperature reaches 165�F. Serve. Oven: Preheat oven to 350�F. Carefully remove film from tray before baking. Place tray on baking sheet on oven center rack. Bake for 40 minutes or until internal temperature reaches 165�F. Remove from oven and serve. Do not thaw. Microwave: Cut slit in film covering tray. Place sweet potato tray in microwave. Cook on high for 4-6 minutes. Remove tray from microwave, stir and let stand for 2 minutes. Remove film. Serve. Conventional Oven: Preheat oven to 350�F. Remove film from tray. Cover with foil. Place sweet potato tray on baking sheet on middle rack of oven. Heat for 30 minutes. Stir. Place foil over tray and continue heating in oven for an additional 30 minutes until heated through. Ingredients: Turkey Breast, Turkey Broth and 2% or less of the following: Sugar, Salt, Sodium Citrate, Sodium Phosphate, Sodium Diacetate. Ingredients: Cured with: Water, Salt, Brown Sugar, Cane Sugar, Sodium Phosphate, Sodium Erythorbate, Hydrolyzed Corn Protein, Sodium Nitrite, Dextrose. Ingredients: Chicken Stock, Seasoning Mix (Wheat Flour, Yeast Extract, Modified Food Starch, Soybean Oil, Natural Flavor [Dried Yeast, Yeast Extract, Maltodextrin, Salt, Vegetable Oil (Sesame & Sunflower), Silicon Dioxide], Dextrose, Onion Powder, Hydrolyzed Corn Protein, Butter Flavor [Maltodextrin, Enzyme Modified Butter (Butter, Buttermilk Powder, Natural Flavor), Salt, Dehydrated Butter, Shortening Powder (Partially Hydrogenated Soybean Oil, Corn Syrup Solids, Sodium Caseinate, Mono And Diglycerides), Guar Gum, Sodium Bicarbonate, Annatto, Turmeric], Nonfat Milk, Salt, Hydrolyzed Corn, Soy And Wheat Protein, Spices, Natural Flavor (Sunflower Oil, Natural Flavor), Cream Flavor (Maltodextrin, Natural Flavor), Silicon Dioxide (Anti-Caking), Oleoresin Turmeric, Oleoresin Paprika). Contains: Milk, Wheat, Soy.